Does the TalkSystem do voice translation from one language to another without an interpreter? No, interpreters are still required for accurate voice to voice translation. Software is available to do voice to print and print to voice but not voice to voice. This technology is still out of reach and not likely to be available for many years. Talk Technologies will certainly take advantage of the technology when it does become available. The Talk System Sylencer, however, does work very well with the latest voice recognition software. How many languages other than the presenter’s language can the TalkSystem support? Not including the language of the presenter, the TalkSystem can be used to translate up to thirty two different languages on eight different channels. If the presentation were in English, then eight interpreters would speak into eight Sylencers that would transmit out to an unlimited number of receivers used by the non-English-speaking audience members. Can I get other accessories with my TalkSystem? Yes! Talk Technologies has a wide variety of accessory products for use with your TalkSystem. Just ask and we probably have it! Does a Stenomask work with voice/speech recognition? Yes! A Stenomask, combined with the Andrea USB Adapter, works extremely well with all popular voice recognition engines such as Dragon Naturally Speaking, IBM Via-Voice, and Microsoft Speech. The real advantage is that it will work in noisy environments where other microphones would have terrible recognition. Reporters, Students, Investigators, Physicians, Researchers, Police Officers or anyone who requires silent speech recognition or reliable recognition in a noisy environment can really benefit from this system. The system requires an available USB port on your computer. What is USB and do I need it to use the Mask? USB stands for Universal Serial Bus and is available on all new computers. Depending on the age of your computer, it may or may not have USB ports available. If not, Stenomask will plug into a standard computer sound card, although this will not provide as good recognition as with a USB adapter. To see if your system supports USB, go to http://www.usb.org/ and download and run the free utility ‘USBready’ that will determine whether or not your system supports USB. What kind of microphone does Stenomask use and what will it plug in to? We provide several different microphones depending on your application. Stenomask can be used with any device that has a microphone input! What kind of plugs are available with Stenomask? Talk Technologies provides three standard plugs with our system: 1/8 inch (3.5 mm), 1/4 inch (7.35mm), and XLR (“three prong”) male plugs. Will TalkTech do custom orders with other mic’s, plugs, or hardware? Yes, we will be happy to put together a special MIC, plug, or adapter to meet your silencing needs. We will send you the device and you will have thirty days to return it, should it not work properly with your system. Why won’t my Stenomask work with my other USB Pod? The standard Stenomask has a plug that will plug into most audio devices. We can provide adapter plugs, should you wish to use the Stenomask with a different USB adapter. These adapter plugs can also be purchased at your local electronics store. My speech recognition “Speech-to-Noise-Ratio” is really low. What can I do? The “Speech-to-Noise-Ratio” is used in speech recognition as a way of rating the quality of your microphone. A high ratio indicates that your speech, when compared to both sound (that occurs when you speak) and electronic noise (anything from computers to car engines that use or produce electricity), is quite strong relative to the noise signals. A low ratio indicates that you may be speaking too loudly or even too quietly into the mask. Refer to the “Proper Breathing Technique” section in the manual that you received with your Stenomask for proper breathing and speaking Techniques. It takes practice to get good recognition but the system does work very well once you master the techniques! Where is the tuning dial in the Steno SR? The non-Pro series of the Steno SR does not have a tuning dial. Where is the tuning dial? 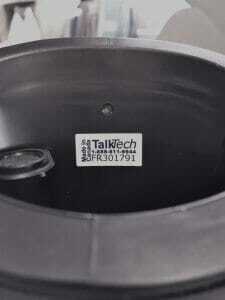 The tuning dial is already calibrated, it is located inside the top of the unit, underneath the foam, just above the serial number. Does Stenomask work with voice/speech recognition? Yes! Stenomask, combined with the Andrea USB Adapter, works extremely well with all popular voice recognition engines such as Dragon Naturally Speaking, IBM Via-Voice, and Microsoft Speech. The real advantage is that it will work in noisy environments where other microphones would have terrible recognition. Reporters, Students, Investigators, Physicians, Researchers, Police Officers or anyone who requires silent speech recognition or reliable recognition in a noisy environment can really benefit from this system. The system requires an available USB port on your computer. Can I use my existing SmartMic voice profile with the Steno SR Pro? Try using your normal profile, run your mic check and then do some dictation. If you are not happy with the results you will need to create and train a new voice profile. What happens if I turn my microphone all the way to the end? If your microphone is turned all the way up, or down, it will be disabled and no longer function properly. If you find yourself having difficulty with your recognition and you have made an adjustment, you have likely adjusted your microphone too much. Try returning to the default position and trouble shooting. The default position is around 10 o’clock, and is recommended to stay at this position. This manual contains instructions for the Steno SR series microphone. This brochure contains information on the Steno SR series microphone. This brochure contains information on the TalkSystem and Sylencer as well as the frequently asked questions and contact information. This is an electronic version of the manual that is included with the TalkSystem. This is an electronic version of the manual that is included with the Sylencer/SmartMic.